It’s difficult to imagine the thoughts in Theodora Cormontan’s mind in 1887 as she stood on the deck of the Hekla and sailed from Norway for America with her father and sister, leaving behind an established music career of performance, teaching and composition. As the coastline faded in the distance, the 46-year-old Norwegian composer probably wondered if her voice, her music, would ever again be heard in Norway. She must have suspected that it would not. In June 2015, nearly 130 years after Cormontan left Norway and 175 years since her birth, with her name lost to the years, her music – her voice – has returned to her native land through a most improbable set of circumstances. Under the stewardship of Gustavus Department of Music Professor Michael Jorgensen and pianist Bonnie Jorgensen, 150 of Cormontan’s manuscripts and 6 published piano works have been safely returned to the archives of the National Library of Norway in Oslo. This unlikely journey touched so many lives and concluded with a homecoming that brought Theodora Cormontan’s voice home. The long journey of Theodora Cormontan’s music began with her birth in 1840 north of Trondheim in Beitstad, Norway, and a family move in 1847 to Arendal on the southeastern coast. Her father, a Lutheran minister in the State Church of Norway, encouraged her music skills and funded her composition and performance study in France, Germany and Denmark. Following her mother’s death in 1865, Theodora returned to Arendal and continued to perform and teach. She also continued to write but she found it difficult, as a woman, to get her instrumental music published. After some time, she founded a publishing company and lending library, becoming the first woman in Norway to start her own music publishing company. In 1887, following the loss of her family’s home to a fire and the financial collapse of the banks in Arendal, Cormontan, her father and sister decided to emigrate. Their journey brought them to southern Minnesota where they joined her brothers and lived for most of the next 30 years. In Minnesota, Theodora once again found a place for her music. She taught music lessons, played organ at area churches and gave vocal and piano recitals that included some of her own works. And she continued writing amassing a 150 score library of personal compositions. Although she was unable to walk unaided or present vocal recitals following an accident in December 1887, Theodora continued to serve as a church organist and choir leader, gave piano recitals, taught and composed for the next 30 years. 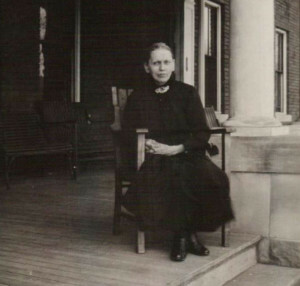 Following her brother’s death in 1917, Theodora and her sister moved to the Aase Haugen Home in Decorah, Iowa, where she met pianist Mollie Schmidt. 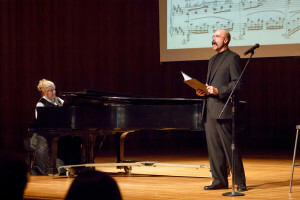 The two developed a friendship as kindred music spirits and Schmidt performed some of Theodora’s compositions in the community. Before her death in 1922, Theodora placed her manuscripts in Mollie’s care. The compositions spent the next 90 years largely forgotten, in storage first with Mollie, then with daughter Carola and finally on to Mollie’s granddaughter Barbara Schmidt Nelson. In 2011, with a move from her long-time family home pending, Barb Nelson offered the collection of manuscripts to musician friends in the area. Bonnie and Michael Jorgensen were among those who looked through the collection of manuscripts and sheet music they could use. The Jorgensens, intrigued by the sophistication of the compositions and curious about the unknown composer, began a search for information on the life and music of Theodora Cormontan. Their research between 2011 and 2015 culminated in a recital/lecture which they have presented more than 50 times and they asked themselves where the music should go. Last spring, the Jorgensen’s completed Theodora’s long journey as they travelled to Norway, presented 4 concerts and delivered her manuscripts to the National Library in Oslo. With musician friends from the U.S. and Canada, they performed at the Western Norway Emigration Museum (Vestnorsk Utvandringssenter) north of Bergen, the Ælvespeilet Kulturhus in Porsgrunn, the Aust-Agder Cultural History Museum (KUBEN) in Arendal, and the National Library (Nasjonalbiblioteket) in Oslo, Norway. An accomplice in this final leg of Cormontan’s journey was Mollie Schmidt’s granddaughter, Barbara Schmidt Nelson. She describes the opportunity to participate in the reintroduction of Cormontan’s music to Norway as a privilege that was “overwhelming.” “Sitting in the new concert hall in Arendal, I could see out across the water to the opposite hillside and the old buildings located there.” Through the haze that day, it seemed possible that what she saw was similar to the images of home the Cormontans held in their memories as they left Norway. “As I sat listening to Bonnie play Theodora’s ‘Evening Sentiment,’ I felt the presence of my grandmother and her friend Theodora in the concert hall that day. It was a very moving, very emotional experience for me.” For Nelson, it felt appropriate to bring Cormontan’s music back to Norway; it was a homecoming that reflected the challenges that Theodora overcame and the perseverance she demonstrated in following her calling. The full circle of Theodora Cormontan’s music was unlikely but, 130 years after her departure from Norway, her music is back home. More than just a single hymn in Norway’s Lutheran Hymnbook, Theodora Cormontan’s legacy today is true to her life. And like that of so many immigrants of any era, it is a legacy of resilience, fortitude and persistence.